Mable was a black labrador and when the Bond family first took her home, she entered it like a small tornado. Everything was exciting! She was just one big wiggle with a tail attached. Whenever she saw someone she would fling herself onto her back, exposing her round pink tummy for tickles. Sometimes she even produced small puddles in excitement. She was the happiest puppy you could hope to own. However, not everyone was delighted by her arrival. Suki was a mottled cat who was aged about four years old and eminently logical. She had inherited her sleek superiority from her Siamese mother and her deft ability as a mouser from her wild Tom father. She watched Mable from the safety of the dresser and puffed her tail in a show of anger. She could really see no use at all for this giddy addition to the family and considered moving out. Mable grew. She was not a dog who showed great intelligence but no one could doubt her affection. When she was shouted at for producing puddles on the kitchen floor, she was honestly distraught at having caused offence, though completely mystified as to what she had done wrong. She greeted everyone with great enthusiasm, often at face height and pulled enthusiastically when taken out on the lead. One cold winter’s night, the relationship between cat and dog changed. The boiler had shut down for the night and the kitchen had a steady draught blowing through the cat flap. Suki looked down from her bed on the cold boiler. Mable was asleep in her basket under the table, curled tightly on her fleece. She looked warm. She also looked still and calm. Suki stealthily left her vantage point and approached the sleeping dog. All remained still and she tentatively stepped into the basket. It was warm. She placed a paw on the dog. Nothing happened. She stepped forwards until her weight was fully on the dog. Still Mable did not wake. Suki slowly lay down. She could feel the dog breathing in slow even breaths and the fur was thick and warm under the cat’s body. She slept. At some point, Mable woke. She found herself under an unexpected weight whose smell she recognised as Suki’s. She knew that close interaction usually resulted in pain and therefore she lay very still, hoping that the cat would leave of her own volition. Thus it was that when Suki herself woke, the dog was still calmly immobile beneath her. 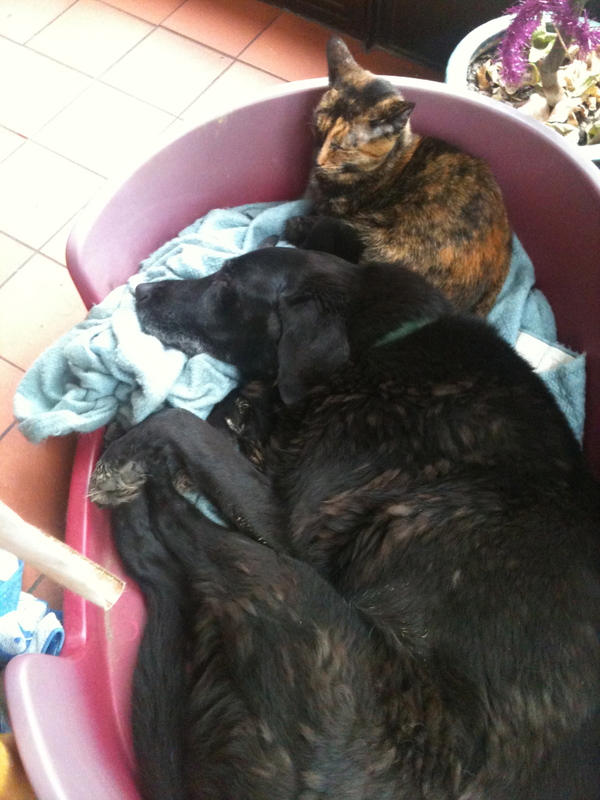 This having proven to be a most satisfactory arrangement, the cat decided to regularly share the dog’s bed. It was warm and comfortable and cat’s crave little else in life. Mable herself grew accustomed to the arrangement and though always slightly nervous when the cat arrived, she found that keeping very still resulted in a pain free experience. Thus it was that Mable and Suki became friends. They were happy in each other’s company, both understanding the rules of the relationship. Sometimes Suki would even drag a captured mouse or baby rabbit into the dog’s bowl and if the Bond family failed to notice, Mable could enjoy an unexpected treat. Time passed, seeping through the seasons and bringing subtle changes. Mable lost her bounce and became happily sedate. She remained loving and gentle but wagged her tail rather than spun in circles. She loved to collect presents and would search the kitchen for tea towels and abandoned socks to bring to the family. At night, when the kitchen was empty, she would collect all the discarded possessions and place them in her basket to mark her ownership. Her gentle mouth never caused damage and the family knew where to look if they were missing a sock or a glove. She continued to be an affectionate dog and never once growled or snapped, even if inadvertently stepped on by a boisterous child. She could oft be found, leaning her heavy weight against her owner’s legs, patiently waiting for her silky head to be stroked. One day, the Bond family noticed their pets were old. Mable’s muzzle had become grey and she rose stiffly each morning, sometimes not wanting to rise at all to greet visitors. She slept more and more and as her back legs stiffened it became uncomfortable for her to walk very far. The two constants in her life were food and Suki. Twice a day, glimmers of the puppy would reappear as her bowl was filled with kibble and she would attempt a stiff legged dance of excitement. Suki now also spent most of her time asleep in the dog’s basket. The two animals were always together, either asleep or wandering slowly around the garden. Suki was obviously an elderly cat. She could no longer jump onto furniture and found even going through the cat flap to require great effort. Her lean form had become austerely thin and her bones formed sharp angles under her sagging fur. Her teeth were yellowed and sore and Mrs Bond started to buy tins of food that were easier to eat than the crunchy biscuits she had formally enjoyed. One day, the animals were both taken to be checked by the vet. Mable could no longer jump into the boot of the car and so she wobbled unstably in the footwell while Mrs Bond drove her and a vocally cross Suki into town. When they arrived, the vet methodically examined them. He felt their backs and under sides, listened to their hearts and looked in their mouths. When he tried to check Mable’s back legs, a jolt of pain shot through her. In sudden anger she snarled and snapped her brown teeth. The vet jumped back alarmed and Mrs Bond rushed to hold Mable’s head. She had never seen her dog be anything other than submissively affectionate and she hastily apologised to the vet. He reassured her and said that animal’s often change in character as they become old. He stated that Mable seemed in good health and was aging naturally for a dog of her years. He thought Suki would not survive much longer but as she appeared pain free, he suggested that Mrs Bond should return home with both pets and let nature take it’s course. It was not many days later, that the Bond family arrived in the kitchen to find only one pet. Mable was asleep in her basket but Suki was missing. They gave the garden a cursory search before starting out for work but there was no sign of the cat. Mable changed when Suki disppeared. She showed no enthusiasm even for food and had to be prised from her bed to toilet in the garden. Both the dog and her bed began to smell unpleasant but Mrs Bond felt that washing either would be unfair so instead she bought air fresheners and kept a small window ajar. Within a week, life seeped away from Mable. One cold February evening, Mr Bond arrived in the kitchen to find her body lying on the floor, her mouth slightly open and her eyes unseeing. There, on the cold tiles, shrivelled and slightly flattened, was a tail. A cat’s tail. A mottled brown cat’s tail. Feeling slightly sick, Mrs Bond scooped it into the waiting bag and went to sit down. Had the dog searched for her missing friend and discovered a sordid memento in some hidden corner of the garden?Or had her aging personality change garnered a more vicious explanation?Was this evidence of unwavering devotion? Or was it an altogether more cautionary tail?